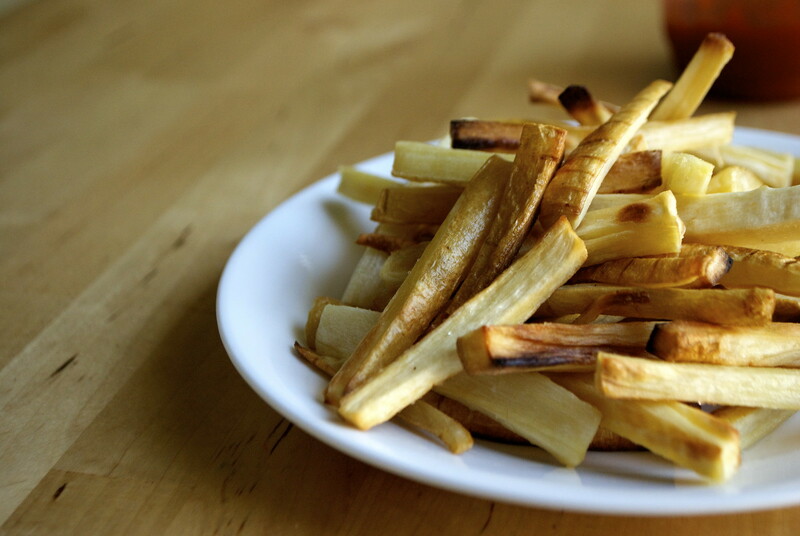 I see myself eating a ton of oven-roasted fries, especially the parsnip variety, when the weather turns colder in the fall. I love pulling a tray of hot, crispy fries out of my oven when there’s rain pouring down outside. There’s something about sitting in your kitchen and eating them warm, a good book in hand. But even in the summer sunshine, these fries are a real treat. I’ve taken to making these over the past couple of (80 degree!) weeks, and they are totally worth turning on your oven for. Was this supposed to be a healthy recipe blog? Did I tell you that? Did I say it? I’m sorry, that must have been a mistake. * I would be making and eating these tarts daily if I wasn’t afraid of running out of butter halfway into the recipe. 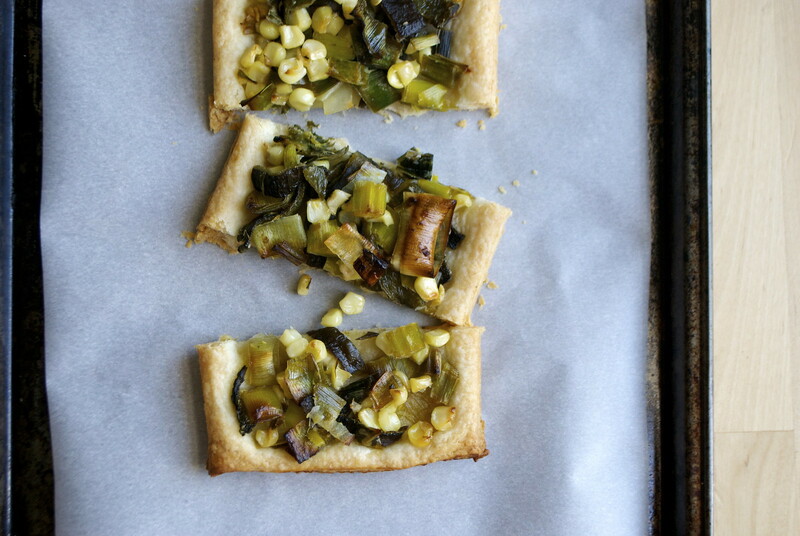 This puff pastry tart celebrates the freshest summer vegetables. I chose leeks, sweet corn, and pasilla peppers, but you could use just about any vegetable that’s at the market this time of year. Paper-thin slices of eggplant and tomatoes, drizzled with olive oil. Rounds of zucchini and yellow squash. Roasted bell peppers of all colors. Blanched potato slices with rosemary and butter. To me, these tarts are all about keeping things simple and elegant. They’re easy enough to make, but they’re something you’d be proud to pull out of your home oven. They celebrate summer produce. 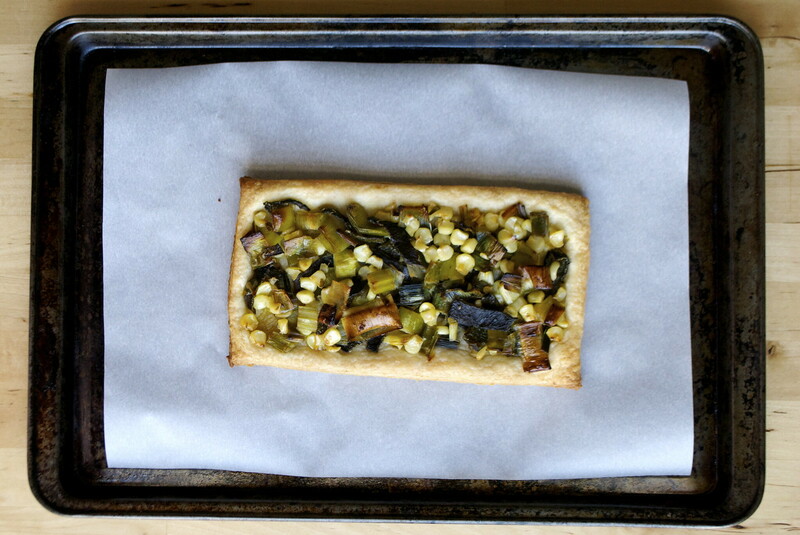 Sweet corn, leeks, and smoky-spicy pasilla peppers are salted, cooked down, and caramelized in a pan, and spread over a homemade, all-butter puff pastry crust. Yes, the puff pastry is homemade. But it’s a “rough puff,” made with a shortcut method that rules out most of the tedium and difficulty of making pastry. Because, let’s face it, I wasn’t going to make a full-on authentic puff pastry from scratch. I’ll take this version— no torn pastry dough and butter messes, no hours-long process of chilling and rolling and chilling again, but still absolutely delicious. Let’s talk about ugly pies. Specifically, how ugly pies are often the best pies. A few days ago, I made a raspberry rhubarb tart that turned out more green than the bright pink I was hoping for. But the flavor? It was spot-on. Take this pie, a personal summer favorite, with misshapen crust and dark, lumpy filling. Without a double crust, and certainly no lattice top, it was doomed to be un-photogenic. Some summer pies are just meant to be ugly. Leaky galettes, graham cracker crusts that crumble when you slice into them, and mystery fruit fillings that are at once too homogenous and too irregular to look appetizing. Those pies, though, are often the best, filled with the summer’s best fruit and baked at home with care. 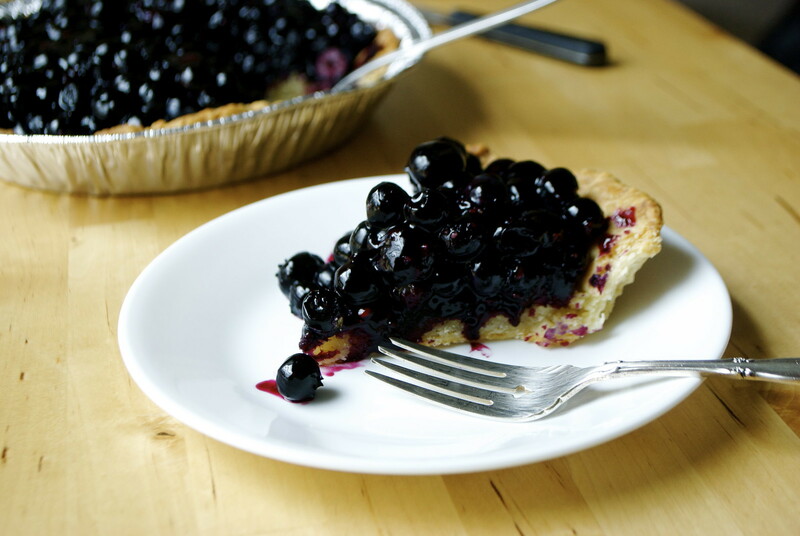 This blueberry pie is no exception. Don’t let the photos fool you– this one is too good to skip. 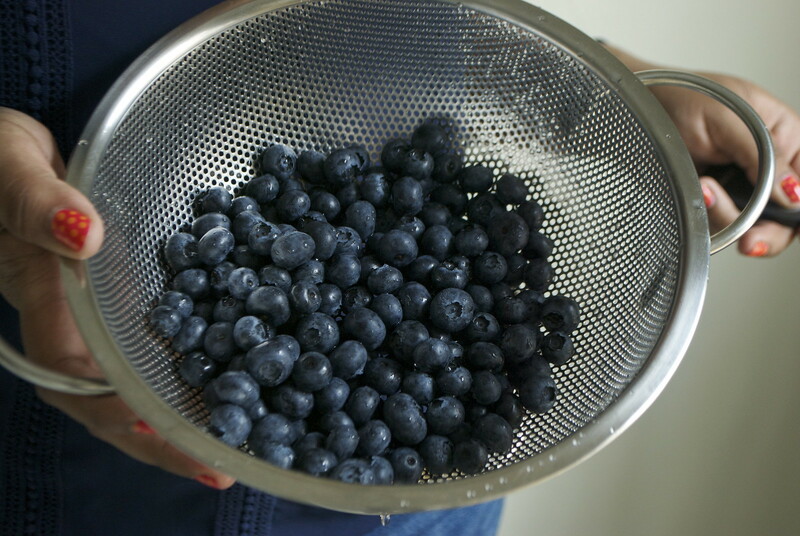 Make your way to a local blueberry farm, or head to Safeway to pick up a crate of berries. Bake a pie this weekend. Bake this pie this weekend. Share it with your friends. You’ll be glad you did. A week or so in, it finally feels like this blog has a home on the internet. Having your own domain, good hosting and a theme you like are such simple details, but they make the biggest difference. And while everything isn’t a hundred percent perfect yet, it’s approaching what I wanted it to be when I first set out to start a food blog back in February. It’s super satisfying to see it all come together. This is also my very first recipe using ZipList— a feature that I’ve wanted to add for a long time, but just now got around to. Having ZipList means you’ll be able to view, print, and save recipes from this blog more easily. It also does all sorts of neat things for the blog, like making sure images of a recipe pop up in Google searches. This particular recipe makes a great weeknight meal. 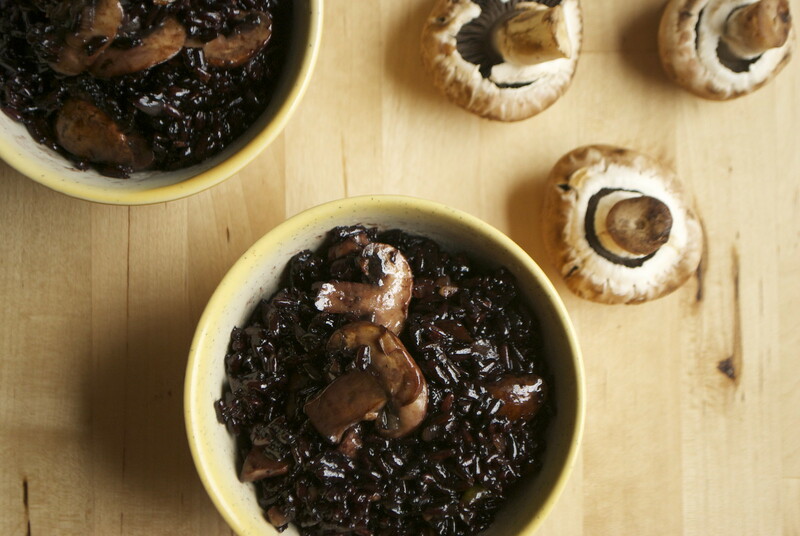 It’s relatively easy to pull together, but the black rice makes it special. Black rice is like brown rice— the grain with the hull left on. But in this case, the hull is black, not brown. This rice is packed with antioxidants and anthocyanins, those very same good-for-you molecules that make blueberries blue and blackberries black. Just like brown rice, this rice contains plenty of fiber. What I love about it, aside from the deep color and major health benefits, is the way that it tastes. Black rice has a distinctive taste and appearance of its own, but also picks up other flavors well. I’ve bought it in the bulk section of our local grocery store, and recently picked up a bag from Trader Joe’s. 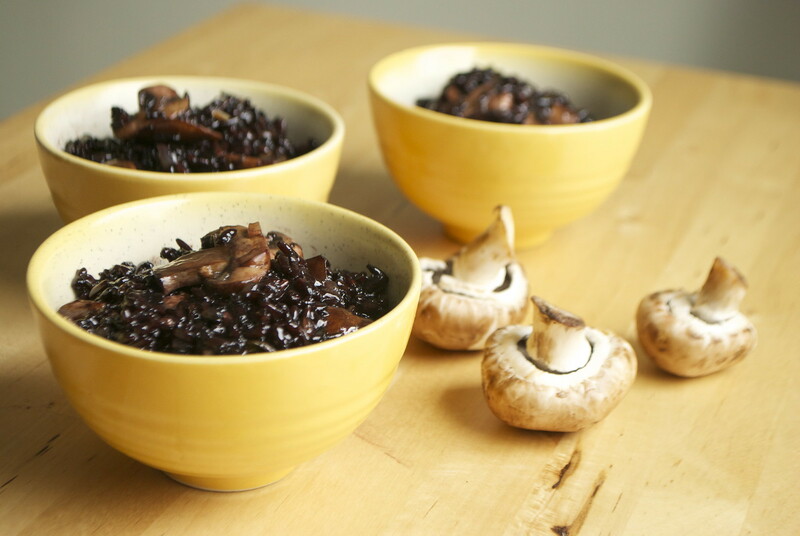 If you can’t find black rice at a store near you, wild rice would make a good substitute. Haaappy Friday! Today I can honestly say that I’m psyched for the weekend. Bring on the sunshine, cool mornings, extra hours off from work, time with friends, and Skype chats with family. Bring on the end-of-summer jalapeños, fresh berries, and lemonade. Bring on the ice cream. 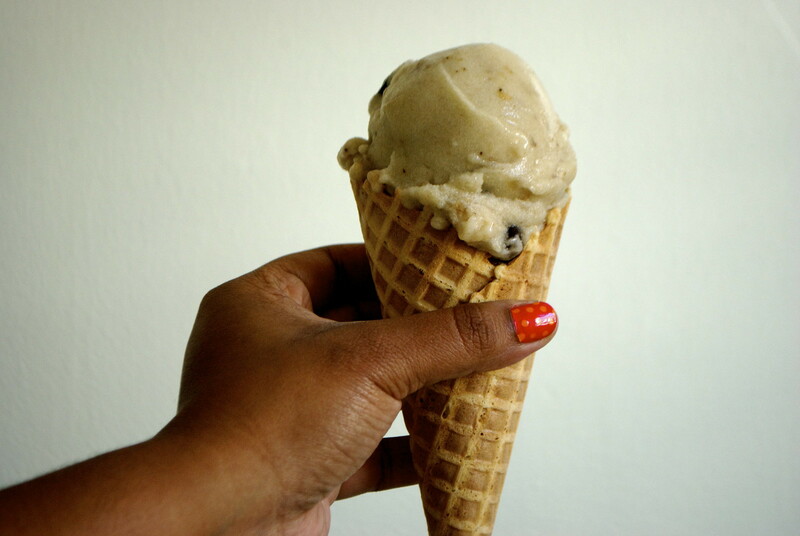 This banana ice cream has been all over the internet. It’s been on every cooking site, baking blog, and pinterest page that I’ve seen in the last few months. So why post it again here? Because it’s amazing. And it’s even more amazing with chocolate chips. Here’s what you do: You slice up a few bananas, freeze them, and then throw the frozen chunks into your food processor. You blend them until they’re smooth and ice cream-like. 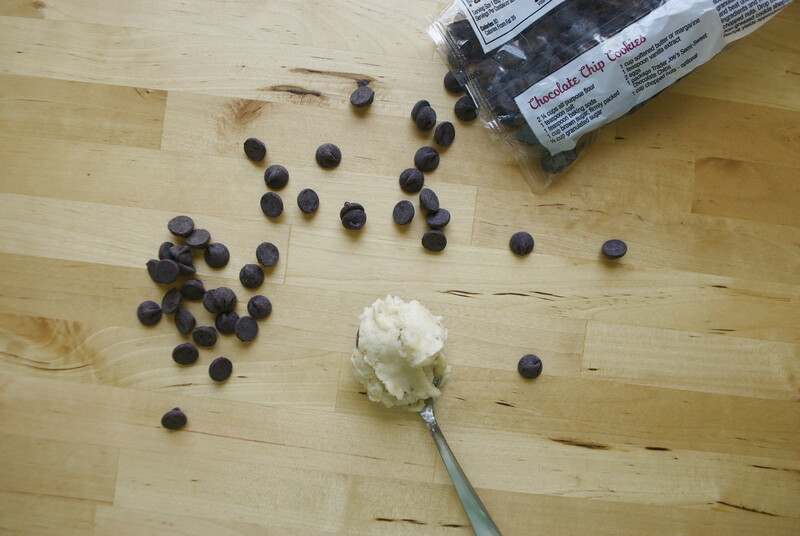 Fold in some chocolate chips, scoop into a bowl, and you’re good to go. 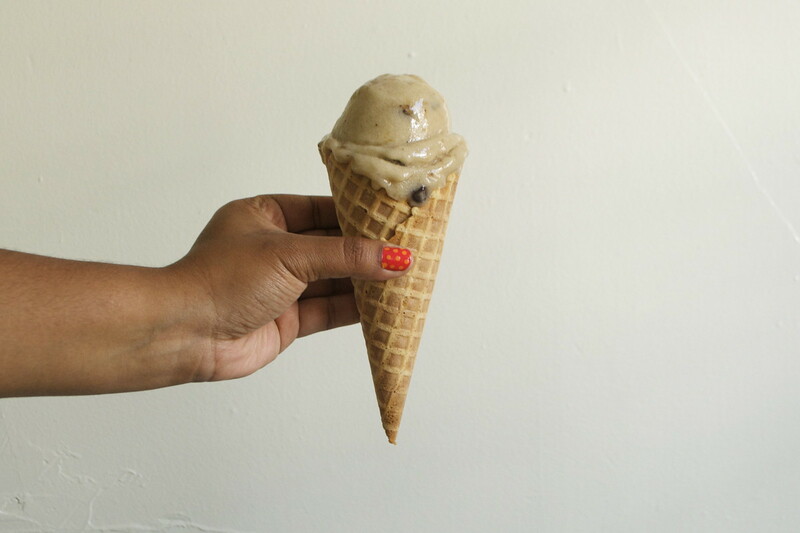 This ice cream barely needs a recipe, but there’s one below if you need details. Go make some ice cream. Go have an incredible weekend! Slice bananas into coins and freeze on a tray or in a plastic bag. This takes anywhere from 3-6 hours. Frozen bananas may be stored in a ziplock bag in the freezer. 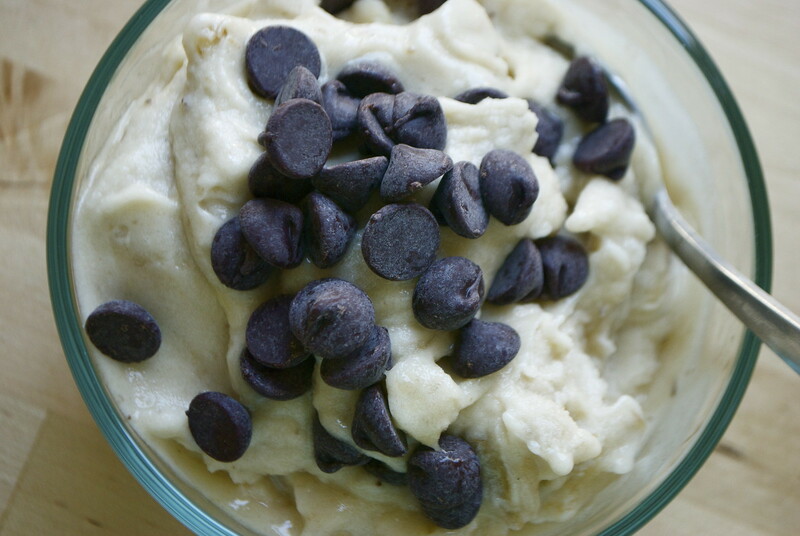 Put the bananas in a food processor or blender, and blend until smooth and creamy. Stir in the chocolate chips. Serve immediately for a soft-serve consistency, or freeze for 30 minutes and scoop out like a regular ice cream. It has been over a month since my last post. The one where I talked about eating healthier, less processed food. I imagined that as I tried to trade bad habits for better nutrition, I’d be posting on here more. But the opposite happened– I’ve barely posted at all. Today, I’m reviving this blog. Better recipes, more inspiration, and (fingers crossed!) more regular posts. This pita pocket recipe, which I made for lunch last week, seemed like a good one to start with. What began as a simple lunch from my pantry became a delicious, fresh summer meal. 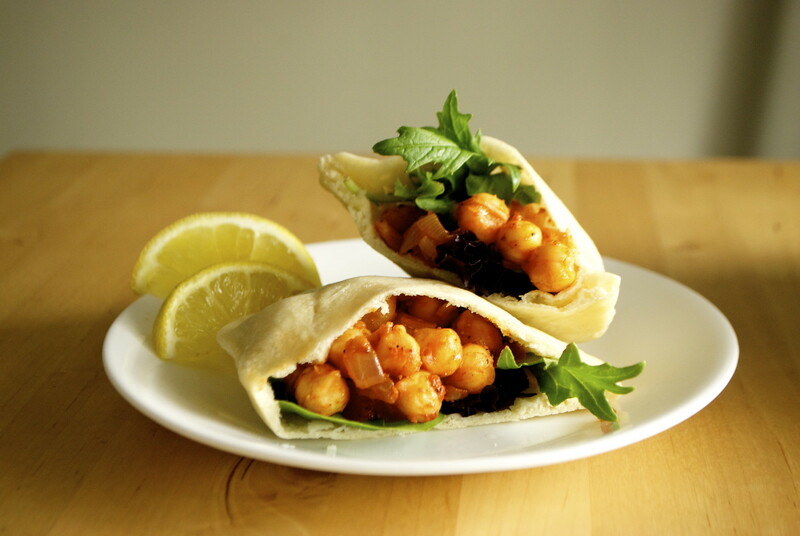 Soft, warm pita bread, a filling of spicy, creamy chickpeas, and a little crunch from the salad greens. This recipe isn’t difficult to make, especially if you mix up the pita dough a day or two before hand. And you can always buy pitas instead, simply making the chickpea filling to complete the meal.